The muscle group that forms your shoulders is made up of three main muscles. People tend to place a lot of focus on their front and middle deltoids, but their rear deltoids are overlooked. To achieve balanced muscle development, enhanced performance, and fuller looking shoulders, you need to target all three muscles. In this article, I’ll be focussing on exercises for the posterior part of your deltoids. I will also be including an example workout, and some take away tips for training this muscle! Your rear deltoids play a large role in maintaining your posture. The main two functions of them are to pull your arms backwards and facilitate lateral rotation. Rear deltoid exercises, for this reason, are great in assisting with the correction of rounded shoulders. 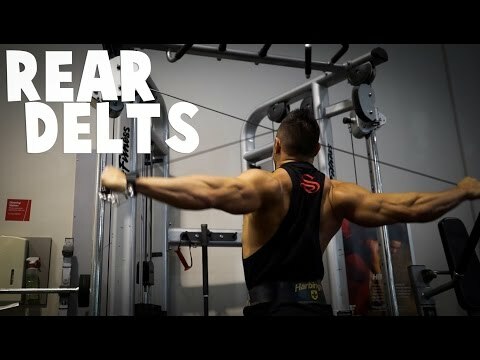 Below you will find a selection of exercises for your rear deltoids, including descriptions, explainer videos and recommended repetition ranges! To make it easier to follow, I have split the exercises into equipment-based categories. Note, for optimal shoulder health and performance, it is important to include a range of movements and equipment in your shoulder workouts. I prefer this seated version of the rear deltoid fly to the standing one, for a few reasons. Firstly, it’s easier to get into an optimal position for isolating your rear deltoids. And secondly, it reduces the amount of momentum you can create through your torso. Sit on the edge of a bench with your knees bent at just over 90-degrees in front of you. Rest your chest on your knees. Hold a dumbbell in each hand with your hands together under your legs, palms facing each other. Place a small bend in your elbows and lock this position throughout the fly. Raise your arms until they are parallel to the ground and pause for a second before returning to starting position. A non-conventional, but very effective exercise for strengthening and conditioning your posterior deltoids. Think face-down snow angel! Lie on the floor or a flat bench, face down. Have a dumbbell of a suitable weight in each hand. Start with both arms behind you, by your sides with your shoulder blades retracted and palms facing the ground. From here, move your arms out wide in a circular motion until they are both in front of you/above your head. Your palms should still be facing the ground. Hold for a second here and then return to having your arms by your sides behind you with your shoulders pulled back and scapular retracted. Pro tip: Don’t lift your head and torso at the end of the movement (when your arms are in front of you). Try to keep your forehead in contact with the bench or floor. Note, this does require good shoulder mobility to be able to do, safely. For this exercise, you need a high bench or an elevated bench as to allow for the full range of motion. Should this be unavailable at your gym, you can do it with a standard bench on an incline. Lie flat, face down on a flat, elevated bench. Have a dumbbell in each hand hanging down either side of your bench, in neutral position. Your palms should be facing inwards, and wrists rotated about 60-degrees from your body. Maintaining this angle at the wrists, row the dumbbells upwards until your upper arms are parallel to the ground. At this point, your elbows will be about 60-degrees from your body too. Pause for a second at the top of the movement before returning to starting position. Pro tip: Make the most of the eccentric phase of the row. Follow this tempo: 2 seconds up, 2 seconds at the top, 4 seconds down and 1 second at the bottom. If you’ve read a few of my exercise articles, you’ll know that I love a single-sided exercise for building balanced strength and size through your left and right sides of the body. This exercise is great for conditioning your posterior deltoids. It increases strength and mobility through your rotator cuff and helps prevent injury. Lie on your side with your knees bent, in a comfortable and stable position. Have a dumbbell in the hand of your top arm and rest it on your side with a 90-degree bend in your elbow. Your palm should be facing the floor. Keeping your elbow in contact with your side, externally rotate your arm through the shoulder joint until your fist is pointing to the ceiling. Slowly return to starting position which should be when your forearm is just below parallel to the ground. Here’s an interesting one for you to try out! You will need an Olympic barbell to complete this exercise. (Interested in buying your own barbell, check out this guide). Set up a bar on a rack at hand height if you’re standing up straight with your hands by your sides. Stand in front of the barbell and grab it with both hands, palms facing backwards. Lift the bar and walk out of the rack. Keeping your arms straight, bend through the knees and hinge through the hips whilst maintaining a neutral spine. You should be in a deadlift position, but with the bar behind you, rather than in front of you. Lock your arms in a straight position and lift the barbell up until your rear deltoids are fully contracted. The position of your body should remain the same with only your arms moving. Squeeze and hold for a second or two at the top of the movement and slowly return to starting position. This is a powerful strength exercise that will get the back of your shoulders feeling the burn! Stand upright, holding a barbell with a grip that is wider than shoulder width apart. Hinge forward at the hips with a slight bend in the knees until your torso is parallel to the ground. The barbell should be in a neutral position on extended arms in a straight line from your shoulders. Make sure you maintain a neutral spine and a braced core whilst pulling the barbell up to just below your chest. Your elbows should be at a rough 45-degree angle to your sides and your shoulder blades should come together at the top of the movement. Pause for a second and then return the barbell to starting position. Pro tip: Exhale on the pull and inhale on the eccentric phase of the lift for maximum power. This exercise is a challenging take on the traditional rear deltoid dumbbell raise. The use of a barbell tests both your shoulder and core stability and will push you to your limits! This is not a beginner exercise and should only be attempted with lifting experience and a developed baseline strength. Grab a barbell (in the center of it) and stand upright for starters, with the barbell by your side on an extended arm. Your palm should be facing you. Hinge forward at the hips until your torso is parallel to the ground. You should have a slight bend in your knees. Place a small bend in the elbow of your working arm and lock this position. Your other arm can be on your hip or behind your back. Perform a raise, as you would with a dumbbell, lifting the barbell until your arm is parallel to the floor. The eccentric phase is important – maintain full control of the barbell! You will see many variations to this exercise. This, however, is the best version for targeting the back of your shoulders, rather than your rhomboids and traps. Attach the rope handle onto the cable machine, above your head. Holding one of the rope knots in each hand, walk the cable out and stand in a split stance. Keeping your core engaged and spine neutral, pull the rope towards your neck/face, sending your elbows out wide. Squeeze for a second and release back to starting position. Pro tip: Don’t let the cable pull you back, you control the cable – it doesn’t control you. Like the previous exercise, you will also see many variations of the cable crossover. 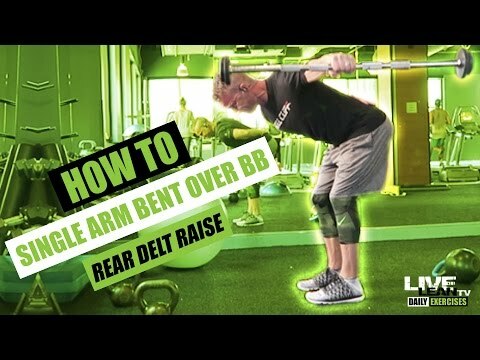 Make this one your go-to for hitting your posterior delts hard! Set each side of the cable on the highest setting/above your head. Use no attachment, you will be holding onto the balls above the clips. Cross the cables over one another, holding the left in your right hand and right in your left hand. Stand with your feet shoulder width apart and a stable core. Place a small bend in your elbows and lock this position. Pull the cables out wide until your arms are in a straight line across your body, squeezing your shoulder blades together. Return slowly to starting position. Pro tip: Think about pulling the cables as far away from your body as possible. Another challenging take on the traditional rear deltoid dumbbell raise, but this time with a cable machine. Attach a single handle to the bottom of the cable machine. Stand side on to the cable, holding the handle with your palm facing you. Perform a raise, as you would with a dumbbell, pulling the cable until your arm is parallel to the floor. The eccentric phase is important – maintain full control of the cable. Here is a quick but effective circuit workout to get your posterior delts firing! This workout consists of 1 warm-up circuit and 1 working circuit. Your rear deltoids are the ones you cannot see when you look in the mirror. 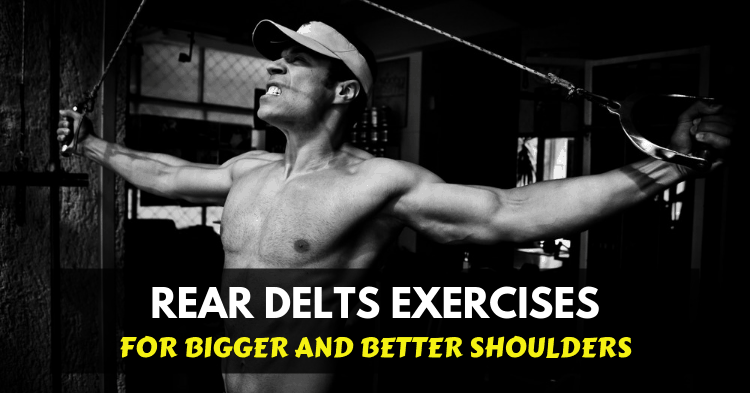 This fact, combined with the way in which most of us prioritize training our pecs, is the reason we have nicely built front and middle deltoids, but for the most part, disappointing rear delts. Here are a few pointers to help you build the size and strength through your posterior deltoids that they deserve! You should already have a ‘shoulder day’. On this day, prioritize your rear deltoids by working them first (and again, last). Another great time to work on your posterior deltoids is at the end of your back and biceps workout, after having done the bulk of your rowing movements. To get the best results, space your shoulder day and back and biceps day out, allowing for appropriate recovery. This one is a bit of a no-brainer – you need to be changing things up! Doing the same thing you have always done will generate the same results you have always got! 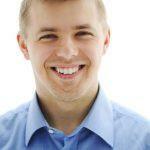 Our bodies get very accustomed to certain movements, and before long are no longer challenged. Make sure you are rotating through exercises over a 4 to 6-week period and providing your rear delts with new and challenging movements and weights to keep progressing. Advanced techniques refer to techniques such as pause reps, drop sets and supersets. These are ways of adding intensity to your rear deltoid workouts without changing the exercises or weights, though you can do that too! I am, personally, a big fan of supersets! They are great for both muscular endurance and hypertrophy. For an extra challenge, try doing a giant superset consisting of 3 exercises, with the last one being a “finisher exercise” that you do until failure, rather than for a set amount of repetitions. There are many exercises that are claimed to work your rear deltoids. But the ones contained in this article are the most effective! If you’re looking to get shapely AND functional shoulders, be sure to focus on your rear deltoids and not just your front and lateral delts. A key thing to remember with training your shoulders in general, is that mobility is key. Make sure you always warm up appropriately to get the most out of your shoulder exercises and to avoid injury! 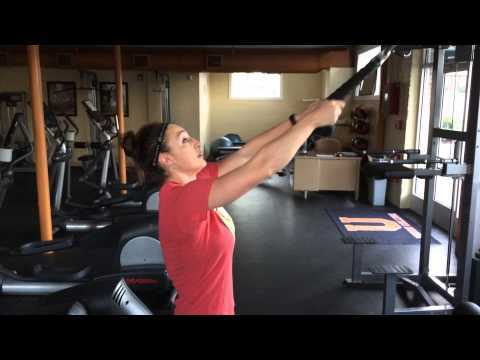 Do you have a favorite posterior deltoid exercise? Do tell in the comments section below!